My friends and I were visiting/doing gymnastics on the living room rug. This was long before I had six babies. And said goodbye to the stomach muscles I knew and loved. I should probably also point out that our living room was large. Explanations are in order . . .
We had been doing forward and backward rolls. Now I was demonstrating the newly-discovered joys of the hand spring. Something I had only recently become proficient at. On the very large mats in our high school gym. For the next few minutes, they tried. With varying degrees of success. “Okay, show us again,” one of them said. Feeling rather important, I stepped to one side of the living room. Put both hands into the air and hopped forward. Hands came down neatly to the floor. And this is that climactic moment where I came to grief. I should explain that one wall of our living room was taken up by a large, brick fireplace. Upon which our aquarium sat. And fifteen gallons of water. You've probably guessed that when rapidly-moving feet hit glass aquarium walls, something's definitely going to give. And it's not the feet. One of mine went right through the side of that aquarium. Now I know you've seen how impressive a broken aquarium looks on TV and in movies. With water and fish pouring out onto the floor. It's really only impressive on the screen. Because, in reality, it makes a huge mess. And one can't do anything to stop it. Even when one tries manfully to hold in the water. With fish and water pouring everywhere, I screamed for my mother. Who came running from the kitchen. Vastly inadequate for the job at hand. My mother was the master of the understatement. The entire front room carpet was rapidly becoming victim to a small wall of water. And helpless fish were flopping about everywhere. I was standing in front of the aquarium with both hands out. In a flash, she had run to the kitchen and returned with a jar to collect fish and what water she could. Then, theatrics over, the cleanup started. This is where the movies are so much better. You see the great aquarium die. And the water and fish pour everywhere. You just don't get to see the massive cleanup that follows. And this was before the days of wet/dry vacuums. We scraped water from that carpet, soaking it up with towels, for hours. Who knew one aquarium could hold so much? Aquarium gone. Little pot, with fish, where it had once stood. And three teenagers banished to the yard. For a moment, we sat there, staring at each other. Ah, the indomitable, undaunted human spirit. If there’s a cute way to say something, kids will find it. It’s up to the adults to remember . . .
Nearly every year, our family vacationed for a week in Banff, Alberta. We had a particular hotel we liked to frequent. Our kids learned to swim in the pool. Play kick-the-can in the nearby woods. Use the workout room for . . . working out. Climb a neighbouring mountain to breakfast at the top. Wander through the nearby townsite. Avoid the herds of elk. Play wall-e-ball in the squash courts. And sit by the fire in the evenings playing games. For that one week, we existed in paradise . . . It is still our favourite destination. Unfortunately, our little two-bedroom apartment no longer accommodates all of us. But we arrange for extra rooms and those who can, come. Now our children are passing their wonderful memories on to the next generation. Teaching their children in the pool. Showing them the best places to hike. And that is where this story is leading. I do take a while, don’t I? We were doing the ‘little kids’ hike around Cascade pond. The easiest one of all. It is a lovely spot, with trails and bridges in a figure eight around and over a round pond. An opportunity to see nature up close without a too-arduous hike to and from. The smallest children were with us. Feeling very important as they participated in their first hike in the wilderness. 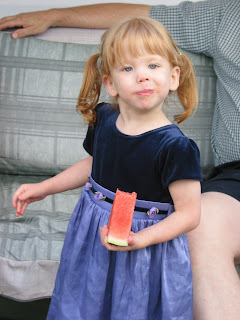 Our (then) three-year old granddaughter had stopped with her mother to look at something. Then, seeing that the rest of us had moved on without them, she ran to catch up. By the time she caught up to us, she was pressing one small hand to her side. Obviously, someone had developed a stitch. “Oh, my feelings!” she said breathlessly. What can make a stroll through the beauties of nature just that much better? A little touch of ‘cute’. Dinner time was special in our house. It was the time when everyone gathered. We are a family of expert visitors. Sometimes, the talk and laughter would go on for hours. Long after the eating had finished. It was the best part of our day. And every dinner time began with prayer. For the blessings of the day and every day. Our children had been raised with prayer at meal times. It was as important as the food. As soon as each of them began to speak, they had their turn. Gently coached in the very earliest days. Given their freedom as they got more proficient. And kids can certainly pray. Sometimes those prayers would go on for some time. Blessing everything from their friends to their toys to their favourite TV programs. It was . . . sweet. And went by all too quickly. Our kids are all grown up now. With families of their own. But prayer is still a big part of their lives. And the next generation is being carefully trained up. 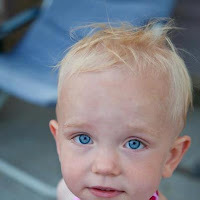 Yesterday, our eldest daughter and her family were sharing the evening meal with my Husby and I.
I should point out, here, that this little girl is just learning to talk. Her vocabulary of decipherable words is . . . not extensive. And this was her first opportunity to say the prayer. Everyone bowed their heads and closed their eyes. “Beloved Heavenly Father,” her mother began. There was a pause as we all waited for the expected response. The repetition of her mother's words. Baby girl opened her mouth. “Eyes!” she said. “We're thankful for our blessings,” her mother went on. “Eyes!” Baby girl said louder, pointing to her mother. “Mama! Nose!” She was making progress. “Eyes!” We were back to that. “In the name of Jesus Christ . . .” her mother paused. Than another chorus of long-suppressed chuckles. But the food was well and truly blessed. Every family has customs at Christmas. Our family has several that fit into this last category. Okay, yes, I know that many, many families enjoy the custom of stuffing a stocking for each family member. It's what goes into said stockings that sets our family apart. On Christmas, after the kids have been shuttled off to bed, Mom and Dad (alias Santa) bring out the loot. Erm . . . gifts. Each stocking is laid out and stuffed full. 4. The orange in the toe. 1. Various styles of catapults. 3. Quirky -- ie. strange – books, puzzles and games. 4. Expanding T-shirts. Just add water. 5. And little tins of meat. Why on earth would someone give his kids catapults. Sooo . . . tinned meats. Every year, each of our children found a tin of . . . something . . . stuffed into the inner reaches of his or her stocking. And I'm not talking tuna fish here. These were tins of something fancifully called: Vienna sausage. All neatly and brightly and attractively packaged. And yes, I realize that there may be people around the world who love Vienna sausage. My kids were raised on the prairie. And served beef three meals a day. With the occasional foray into the world of chicken or pork. If the animal didn't originally bellow, oink or cluck, they regarded it with deep suspicion. Okay, the ingredients listed on the Vienna sausage tins said: beef and/or chicken and/or pork and/or meat. But it was mechanically de-boned and mixed with . . . other stuff. So in the words of my kids, mystery meat. Need I say that my Husby's gifts weren't received with gladness? It . . . wasn't popular. No tin was every willingly opened again. And when the detritus had been cleared from the front room after the all-important opening of the gifts, the only things remaining were several tins of meat. Left where they had been dropped upon being discovered. Husby immediately scooped them up and stowed them carefully away. Only to bring them out and drop them into another stocking the next year. 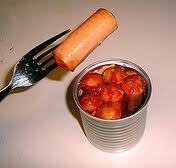 One particular tin of sausage re-appeared six years in a row. The last year in Argentina, where our youngest son was living at the time. Something we didn't think was possible. One of our kids asked their father why he kept putting those little tins of -to them- inedible meat in the stockings. His answer surprised all of us. I was sitting in a Sunday School class yesterday. The group was studying a particular scripture. It concerned what happens when we all die. The teacher explained that, when we die, all of us will be taken back to that God who made us. I was with him that far. Then he explained that everyone will wait there until the final judgement. The righteous in a state of peace and calm. The wicked in a state of anxiety knowing that the final judgement won't be pretty. It was an interesting class. It reminded me of something. Because I have an active imagination. And because I can't pay attention to anything for more than two minutes. Unless there are moving pictures and/or shiny things . 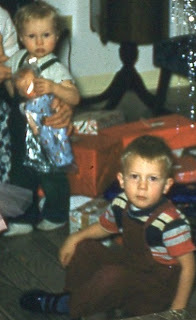 . .
My next older brother, George, and I used to squabble. I can say that because this is my blog. Okay, yes, it's connected to his blog, but I'm going to worry about that later. I don't think we could exist in the same room for more than a few seconds before a fight would break out. He says I'm playing stupid games! My mother tried all sorts of remedies. The only thing that worked was 'time out'. George and I spent many, many minutes thus engaged. For first offences, such as minor disagreements over toys, she started out small. This punishment was usually informal. Consisting of a few moments spent sitting at opposite ends of the table. If the crime was a bit more serious, ie. name-calling, time was added. Then there were the major offences. Where things had gotten a little . . . physical. Hair pulling and/or pinching and/or scratching. Not only did we lose playing privileges. But we had to sit in very close proximity to the person who had landed us in this predicament. Did you know that, sometimes, older brother have cooties? Back to the discussion in Sunday School. And I don't mean to be disrespectful. But I think I know precisely what the teacher was trying to tell us. My brother and I sat on that piano bench for what was probably only a matter of minutes. But which seemed like hours to a four-year-old. Waiting for the punishment of a just father. If you could . . .
Marie took a bite of her sandwich. “So what have you decided? Are you going to come with us this weekend?” she asked. “I can think of nothing I'd like more,” Lucy said. “Well, maybe I've got a little secret,” Lucy said. “Oh, I've waited all week for this!” Frank said, relaxing back into his chair. “Lucy! You're not smothering yourself in repellant!” Darius said. He handed a bottle to Frank, who squirted some into his hands and started rubbing his head and arms. Lucy's smile grew wider. “I just happen to know something you don't,” she said. Frank handed the bottle to Marie. The others stared at her. Marie blinked, then shrugged. “I have no idea what you are talking about,” she said. She pushed the top back on the bottle and dropped it under her chair. Marie picked it up and tossed it to her. Lucy turned the bottle and stared at it. There was a picture of the lizard on the front. “This from the woman who has been basting in the stuff for the past how many years?” Frank said. Lucy glared at him. “Of course I can read,” she snapped. Darius pointed to the words under the picture. Lucy frowned and pulled the bottle closer. Repels tyrannosaurs and most species of carnivore. Not effective on water beasts. Just then, a loud roar split the silence. The applause was thunderous as Lucy and Larry made their way to the podium. Breathless and smiling, they stood there in the spotlight and waved to the crowd. Lucy reached for the heavy trophy. “Thank you, Dr. Rogers,” she said. “We are honoured,” Larry added. The applause and cheering were deafening. Dr. Rogers was back at the mike. “So, what's next?” he asked. “Is that what you're going to wear?” Larry asked. “Lare, this is all about functionality, not fashion,” Lucy said. “Oh, shuddup and get on with it,” Lucy said, grinning. Larry laughed. He twisted a couple of dials. “Okay, I'm ready,” he said. Lucy pulled the strap of a small bag over her shoulder and buttoned her heavy, cotton jacket. “Me, too,” she said. “Wish me luck,” Lucy said, stepping into the booth. Lucy stuck her tongue out at him. “But, good luck!” Larry pushed the brown button. An orange glow filled the booth. With a slight 'pop', Lucy disappeared. Larry set some controls and glanced at the clock. He pressed a button. “Trial 238, proceeding,” he said. “Time: 2:59 PM.” Then he left the room.